Back in April 2011, stuck in a monumental traffic jam on Interstate 5 just north of Seattle, I switched on the radio and hit the Seek button, hoping to find a station with an up-to-date traffic report. “Maybe they’ll recommend a way around this mess,” I thought to myself hopefully. Rather than finding helpful directions to a faster route south, however, I stumbled instead upon a pair of sports radio personalities on 950 KJR AM jabbering nonsensically in typical fashion about something they found interesting for obscure reasons known to them alone. I was about to hit the Seek button again when I heard one of them unexpectedly mention shawarma. That got my attention. I stopped worrying about traffic and started listening more carefully to what no longer seemed like mindless blather. It turned out they were critiquing a survey conducted by the website FlowingData comparing the demographics, personality traits, fashion choices, food and drink preferences, and more of PC users with those of Mac users. If one is to believe their findings (be advised, you do so at your own risk), 36 percent of PC people are liberal, compared with the 58 percent of Mac people claiming that distinction. Again according to FlowingData, Mac users fall into a statistically significant lower average age group than do PC users, prefer Vespas to Harleys, salty snacks to sweets, and San Pellegrino Limonata and Boylan’s Root Beer to Pepsi, Jolt Cola, and Orange Crush. Does any of this sound like you, dear readers? On which side of the Great Computer Divide do you fall? Do you fit any of these stereotypes? Do any of them fit you? What’s missing from this picture? Based on its survey results, FlowingData further claimed that Mac people are far more likely to frequently throw parties than are their PC counterparts. If accurate, that surely must mean that Aramco ExPats were/are more likely to be Mac users than PC users. For how else can one logically reconcile FlowingData’s survey findings with the endless succession of spur-of-the-moment house parties we ExPats so much enjoyed who were living in the Aramco camps in the ’70s and ’80s and ’90s? The Aramcons I lived and worked with back then were world-class party throwers (and goers) one and all—ergo, Mac people as characterized by FlowingData. Or not. One of my fondest memories food-wise from my time in the Kingdom—one that still makes my mouth water whenever I think about it—is that ultimate Arabian street food, the shawarma. It turns out that—as reported by Flowing Data, anyway—along with hummus and bánh mì, shawarma is one of the three stated sandwich preferences of Mac people, as opposed to the tuna fish, patty melt, and hero options prized by PC people. In counter-argument, is there an Aramco ExPat anywhere in the world that hasn’t heard of and tasted a shawarma? I sincerely doubt it. Who can forget such a distinctive culinary delight? Not I and not, I wager, most readers. Their take on shawarma was greatly aided by the meat and fixin’s being wrapped in an admirably-close approximation of Arab bread, the signature flatbread of Saudi Arabia so hard to find wherever I’ve lived here in America since my return. Over in the Kingdom, the buying of fresh Arab bread by locals was part of their daily routine, with Saudi families visiting neighborhood bakers several times a day to purchase this slightly-leavened, milk-and-shortening-free dietary staple fresh from the traditional clay tannuur to anchor their next meal while still warm. The flat round loaves would puff up in the oven but quickly fall flat again after being removed and cooling down. I remember fondly Arab bread, being topped with meat shaved from the rotisserie grill, and adding yogurt sauce, vegetables, and other garnishes, taking care not to overwhelm the meat with too many add-ons. They were rolled up together in a piece of paper and there was my shawarma sandwich. The ideal shawarma requires genuine Arab bread and a balanced combination of meat and accompaniments such as onions, tomatoes, and pickles (my favorite). While the bread at my local café here isn’t true Arab bread, it suffices to my liking. Pita bread from the shelves of our local Safeway sadly fails to cut the mustard. Shawarmas can be found all around the world. I have an American friend who learned to love them on frequent trips to Moscow, Russia and London, UK. He raves about the offerings of a favorite café on Edgeware Road in Greater London, but swears that the best shawarmas he’s ever tasted were served by an outdoor vendor at the Izmailovo flea market in Moscow where he often went to shop for Palekh lacquered boxes and Matryoshka nesting dolls as gifts for his friends back home. He’s never tasted a true shawarma prepared in Arabia and served on genuine Arab bread, however, so he doesn’t know what he’s missing. On past trips to Athens and Thessaloníki in Greece, I’ve enjoyed some notable examples of shawarma—not to be mistaken for that country’s signature street food, gyros. It’s easy for the uninformed to confuse the two offerings. 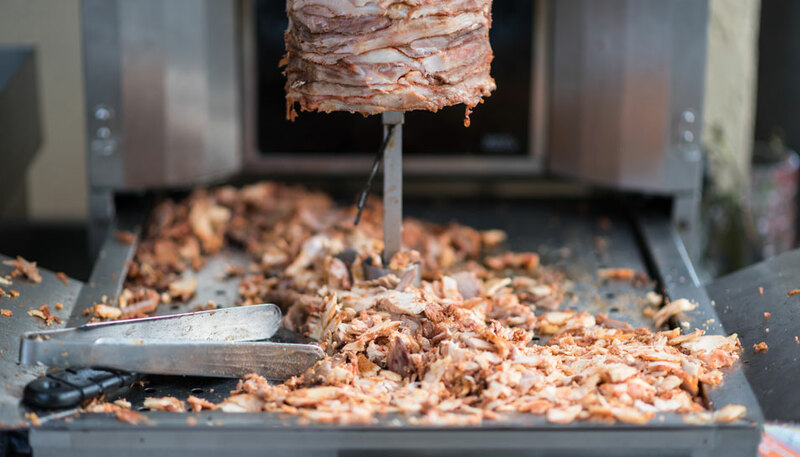 Both have similar origins to their names—“gyro” is the Greek word for “turn,” while “shawarma” is an Arabic word for “turning.” Both terms evoke the image of the vertical rotisseries used to cook the meat. The distinctions between shawarmas and gyros are subtle yet decisive. Their meats are prepared differently and rely on contrasting mixes of spices for their flavoring. A shawarma might be crowned with tahini or tabbouleh, but never in gyro fashion with tzatziki, that delightful Greek confection made up of cucumbers, dill, lemon juice, and yogurt. As much as I love tzatziki, given a choice, I’ll take a shawarma every time. The same goes for the Turkish doner kebab, another street food staple of the Levant and Middle East sometimes compared with shawarma. Not even close! Gyro, doner kebab, or shawarma? My vote goes to shawarma. Old habits are hard to break, especially ones as tasty as this. AXP invites readers to submit their own favorite shawarma recipes. We’ll publish the results at a later time. Email recipes to [email protected]. Readers may be wondering, am I a PC person or a Mac person? Mostly I’m a PC person, but in certain unguarded moments my Mac side shows through. We ExPats are citizens of the world, after all, and not easily labeled. Whatever my PC side may demand, my enduring love of shawarmas leaves me susceptible at times to the allure of Mac options.